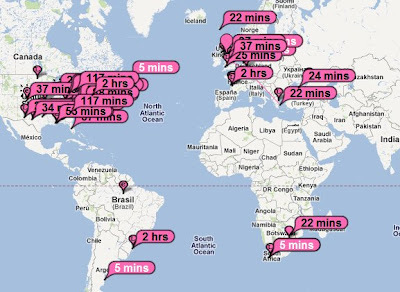 Propagation remains good on 10 metres. I left the K3 on 28.076 running JT65-HF for most of the day. I made several contacts including N3CAL, WA2CRB, PY8ELO, KE1AF, WB9OTX, WK8G and SV4FFK. The map shows where my signal was heard. I was even spotted by Joe, W6CQZ/4, the author of the excellent JT65-HF software. JT65 is addictive. It's also a very relaxing way to make QSOs. It's ideal for me at the moment because my eyes tire very easily. I end up with blurred or double vision if I read or stare at the computer screen for too long so modes like PSK31 aren't really a good idea. Thanks to the JT65-HF add-on JT-Alert an alarm sounds if a station I haven't worked before calls CQ and another sound wakes me up if a station replies to me. This means that I can look out the window or something and only need look at the screen when I have something to do. The print in the JT65-HF program window is nice and big too. Listening on 28.076 I heard some strange noises which I eventually realized were FM transmissions being received in SSB mode. CBers transmitting out of band I presume. I don't suppose many CBers read this blog but come on, guys. It's none of my business if you choose to operate illegally but if you do, please stay below 28MHz. You may not hear our weak JT65 signals with your FM radios but we sure as hell can hear you. Update: Just worked Joe "The Man" W6CQZ/4 in Florida. He was running 5W to what I seem to remember him posting once in the JT65-HF Google group is a Hamstick on a mag mount stuck to the roof of his shed. Thank you Joe for the contact and for the fantastic JT65-HF software! I was using the attic dipole, Paul. The magnetic loop doesn't tune above 15m. I think you're hearing those damned Russian taxi companies again (no disrespect to your XYL intended). Most of the ones I hear have a female at the microphone using FM. Fortunately, JT65 is as immune to interference as WSPR so it will hardly notice an FM transmission over the top of it. You can rest easy. One of the fascinating things is how WSPR on 20 meters can pull out and decode inaudible signals underneath S9 RTTY at the weekends. 14.0956 seems to have regular weekend RTTY right on top. No problem for WSPR though.